What's Apple going to do with a 3×3-cm touchscreen display? New iPod? 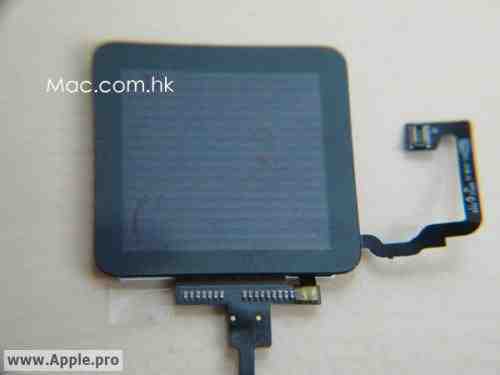 New MacBook Pro touchpad? We have here what appears to be a new touchscreen interface for a Mac. Exactly what type of Mac, or when it’s due, or whether it’s even real, not sure. The leading candidate, however: a touchpad display for the MacBook Pro. Tenterhooks, people, tenterhooks. The photos appeared on the Internet by way of a Taiwanese Apple site, a site that’s struggling to stay online right now. Go figure. It’s a 3×3-cm touchscreen, yes, but for what? Again, nobody really knows, but guesses include an iPod touch nano (perhaps related to the new iPod mentioned yesterday?) and some sort of MacBook Pro dealie, perhaps a new touchpad. It should be noted that the site where these photos come from does have a record of providing bona fide Apple hardware leaks, so make of that what you will.